Did you know that there’s a secret tenderloin juicy temperature? If not, check out this tutorial to make the most mouthwatering smoked pork tenderloin you’ve ever tasted! 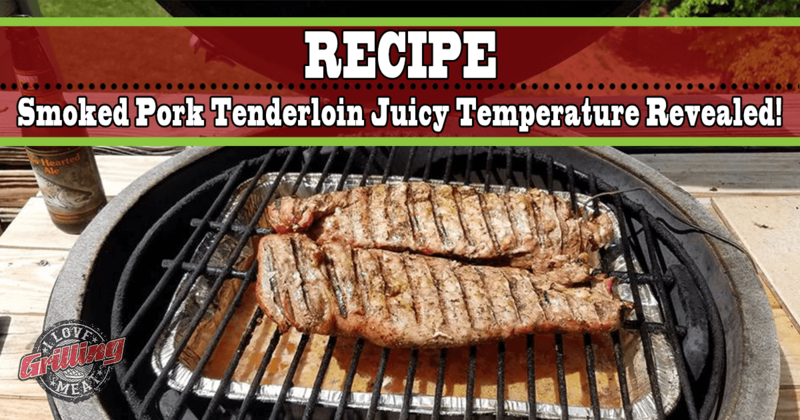 Smoked Pork Tenderloin – Juicy Temperature Revealed! First up, let’s trim the pork tenderloin. There’s probably not a lot you will have to do, as tenderloins usually come ready for smoke. What you might want to do is trim off the nub at one end of the loin, as this makes for slightly more even cooking. Next up, give the tenderloin a good coat of your favorite pork rub. Make sure to coat all sides, then let it sit at room temperature to allow the meat to sweat through the rub. In the meantime, set up your smoker for cooking in the 275ºF-300ºF range. When temperature is stable, put the pork loin over indirect heat. Cook to an internal temperature of 135ºF. This should take about 1 hour. You can mix the ingredients either in a regular pan and simmer on the stove for 10 minutes, or use a disposable roasting pan and cook for 10 minutes on the grill, right next to the pork loin! Just make sure to mix the ingredients well with a fork. This will act both as a glaze and finishing sauce. When the tenderloin hits a core temp of 135ºF, give it one coating of sauce and place it back on the cooker. Now, keep a close eye on the internal temperature for the rest of the cook. When core temp hits 145ºF, take it off the heat immediately. This is the secret pork tenderloin juicy temperature – let it rest for 10 minutes, and serve right away. The tenderloin is going so juicy like you won’t believe!